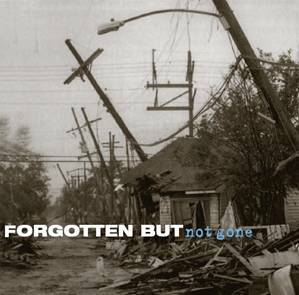 Forgotten But Not Gone is a CD project out of Nashville to raise money for ongoing Hurricane Katrina relief efforts on the Gulf Coast. Many people are unaware that today, five years after the strike of Katrina, tens of thousands of Gulf Coast residents remain displaced from their homes. Experts predict it will be many more years before the needed rebuilding is complete. Unfortunately, the world suffers an endless series of catastrophic tragedies, each of which requires urgent aid. It can be all too easy to forget those who are still struggling with the long term recovery from events which are no longer front page news. Already short of funding, home-building organizations along the Gulf are now challenged further by their need to help with the consequences of BP oil spill. This CD is an all-volunteer grassroots project of Gulf Coast Relief, Inc., a 501C3 non-profit organization. All artists, songwriters, executive producers, record labels,publishing companies, graphic designers,publicists, and many others have donated their performances and/or services. All proceeds go to home-rebuilding charities. By buying this record, you will help residents of the Gulf Coast in their fight to restore their homes, their dignity, and their beloved communities. But just as importantly, each purchase signifies to Gulf Coast residents that someone cares and that they are not forgotten. Until July 2010, all proceeds were split 50/50 between Mission on the Bay, of Lutheran-Episcopal Services of Mississippi, and the New Orleans Home Rebuilding Program of Episcopal Community Services, an arm of the Episcopal Diocese of Louisiana. These wonderful organizations have worked very hard to rebuild homes, communities and lives. 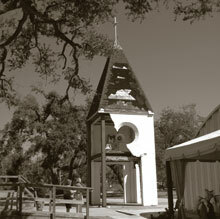 In June 2010, Mission on the Bay closed its doors after five years of dedicated service. The story of their accomplishments is as inspirational as anything one could ever read. 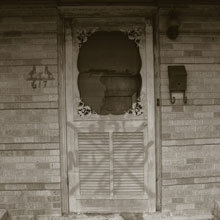 In May 2010, Nashville and other areas of Tennessee were devastated by a thousand-year flood. Episcopal Community Services in New Orleans made the phenomenally heartwarming offer to donate a portion of their share of profits from CD sales to flood victims in Nashville. One-half of the proceeds from all sales originating in Nashville will now go to Nashville flood relief organizations. Proceeds from other sales will continue to go to our original mission, which is to help Gulf Coast residents who remain displaced from their homes five years after Hurricane Katrina. Read more about the recipient charities. Forgotten But Not Gone is a collection of heartfelt songs by the royalty of American Roots music. It includes many new releases recorded just for this project. Special thanks to all of those who helped make this project a reality. Your contribution to our efforts to help the victims of Hurricane Katrina are invaluable. View a full list of those who helped with this project. Aug 2010 - August 29 marks the fifth anniversary of Hurricane Katrina's devastation of New Orleans and the Mississippi Coast. Please tell your friends about this project! Help us to spread the word and help those still displaced from their homes after all this time. July 2010 - Mission on the Bay is closing its doors after five years of dedicated service. The story of their accomplishments is profoundly inspirational. May 2010 - Who would have thought that a few short months after Nashville musicians came together to help New Orleans, Nashville and other parts of TN would be devastated by a flood of their own. As Nashville simultaneously suffered from the flood and rejoiced at the kindess of the countless volunteers who came forward to help each other, it was especially sobering to think of the Gulf Coast residents still going through it five years later. It has also deepened our appreciation of those who haven't forgotten them and have continued helping all this time.